Vulcano holidays take you to a secluded island just off the shore of Sicily. It’s the perfect place for adventurers who want to explore something new, while couples will love the laid back feel. Here you’ll find rugged mountainous landscapes and a wild coastline created by the island’s volcanos, giving the island its name. Those wanting to experience a taste of the island’s history should head to the lively centre of Fossa di Vulcano, which dates back to the ancient Roman times as a holiday hotspot. Here you can explore the pretty streets or take in the history of the Roman ruins and Medieval buildings. Alternatively, head into the striking natural landscapes which can be found throughout Vulcano. Here you’ll find sulphurous craters and spectacular views of the sparkling sea from the top. Along the coast the beaches are black and sandy, with bright yellow rocks and bubbling mud baths, ideal for a day of exploration. Luxury holidays in Vulcano bring you an experience like no other. This wild island is home to some excellent shops, restaurants and hotels, but it’s the natural landscapes that draw visitors from far and wide. Relax and unwind in a warm mud bath by the sea, soak up the sun on one of the black sandy beaches or marvel at the bright yellow rocks painted by the steaming volcanic streams. When it comes to choosing a hotel for your luxury holidays in Vulcano, at Sovereign we have you covered. Our Trusted Advisers will take the time to get to know you before recommending one of our carefully selected properties to ensure you can simply focus on relaxing and enjoying your holiday. 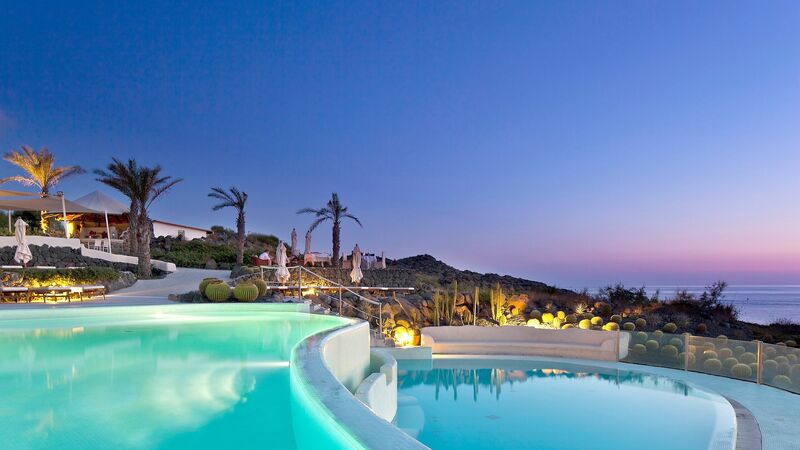 Stay at the Therasia Resort Sea & Spa and enjoy secluded luxury surrounded by spectacular natural views. Elegant interiors and chic sun terraces offer views of the infinity pool, glittering ocean and rugged rockfaces below. The mud bath of I Fanghi di Vulcano tempts in well-being buffs, celebrities and locals alike. Rich in minerals, it’s said to soothe away everything from arthritis to back ache. Many people visit Vulcano for one reason – to scale Fossa di Vulcano, one of the highest points in the Aeolian Islands. The main footpath is steep but easy to follow, zig-zagging upwards from the southern edge of Porto di Vulcano. Partway up, you’ll come across a crater-side bar. Cool off with a lemon granita – or save it for the way back. There are panoramic island views all the way up, so feel free to stop whenever you fancy. If you do make it to the top (between 1 and 1.5 hours of hiking), you’ll be rewarded with a peek into the smoking ‘Grand Crater’. Circle the copper-red rim for wall-to-wall island views. The nearest airport to Vulcano is Catania. Direct flights from the UK take approximately 3 hours. Transfers by road and ferry from Catania Airport take approximately 3 hours.